(From left) Emma-Kate Rose Chair of Queensland Social Enterprise Council (QSEC) and General Manager of Food Connect, CEO of Welcoming Intercultural Neighbours (WIN) Natalia Muszkat, CQUni Social Innovation Program Manager Steve Williams, Rebecca Green from Social Traders and Associate Professor Lara Carton from CQUni’s Office of Social Innovation. 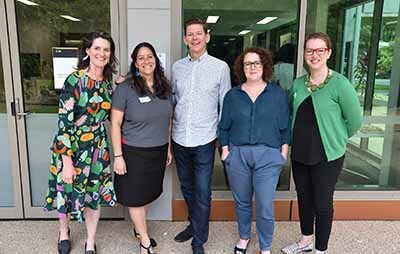 CQUniversity has hosted a full-day workshop for social enterprises keen on exploring their social impact, diversity and sustainability challenges. The Rockhampton workshop, hosted in partnership with Queensland Social Enterprise Council (QSEC) and Welcoming Intercultural Neighbours (WIN), attracted about 20 people from Gladstone and Rockhampton-based social enterprises. Expert facilitators on-hand included WIN CEO Natalia Muszkat, Social Traders Engagement Manager, Rebecca Green, QSEC Chair and Executive Director of Food Connect Foundation, Emma-Kate Rose, and CQUniversity Assistant Vice-Chancellor (VIC Region) and Director Social Innovation, Lara Carton, and CQUniversity Social Innovation Program Manager and QSEC Vice-Chair, Steve Williams. "Queensland is abuzz with social enterprises, and it’s important that social enterprises and entrepreneurs are given the support, tools, and advice they need to overcome the sustainability challenges present in today’s economic climate,” Steve says. “Some of the most common sustainability challenges faced by Australian social enterprises are access to the market, access to finance - from seed funding to growth stage – and the often inevitable tension of running a business. “As part of the workshop, attendees were required to unpack their individual, organisational and regional sustainability challenges, before expert facilitators worked with them to develop tailored solutions. “Rebecca Green of Social Traders, an organisation that links social procurement buyers and sellers together, also presented at the event. CQUniversity is the first Queensland buyer member of Social Traders and is actively working on developing its social procurement practices, buying locally and with impact. Given the event's success, these workshops may be rolled out across other CQUniversity campuses.